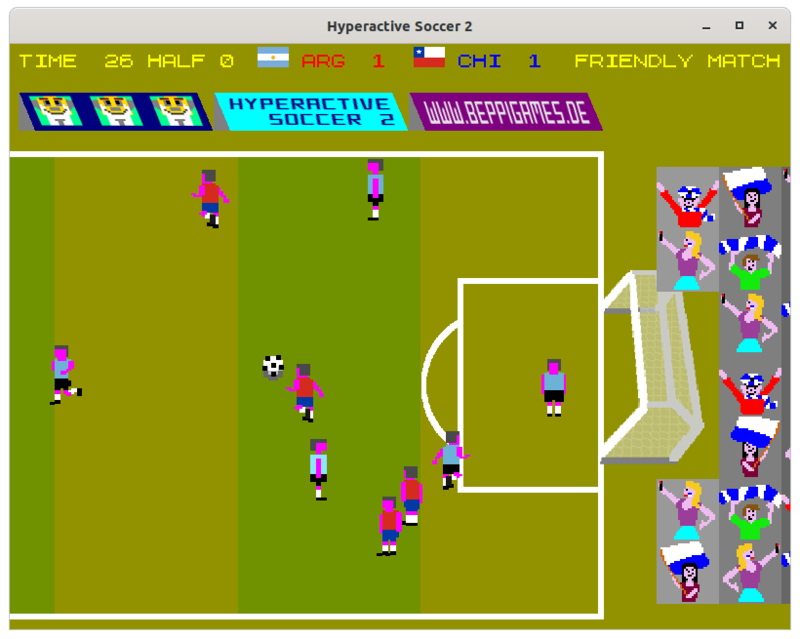 A fast-paced single player action oriented retro soccer game. 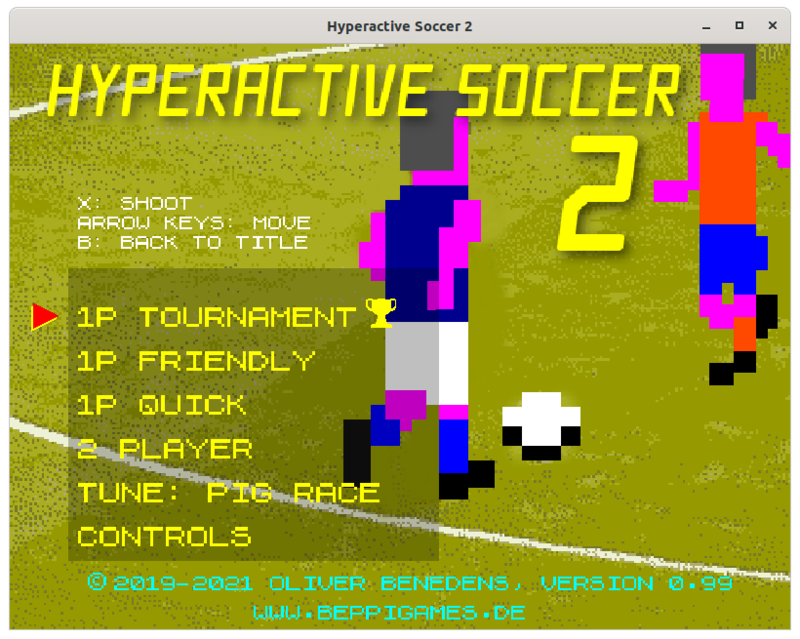 Finally a new Hyperactive Soccer ! Refined play: E.g. you can dribble and other team members are more "responsive" to your passes. Also made new music for it. WebGL capable browser required. Suggested to play in fullscreen (click the button "fullscreen" below the render area). You play 5-a-side soccer against the CPU in one of three modes: In mode "tournament" you pick a team and play a tournament starting from the quarterfinal. A draw counts as defeat (there is no penalty shootout). The nations have different strengths, so for a start you may want to pick a stronger one. If you win the tournament, celebrations follow. In mode "friendly" you play a friendly match between two nations. Again, nations have different strengths. In mode "quick" you play a match with teams of exactly the same strength. For that purpose you select brain and speed levels which apply to both teams. Speed refers to speed of running and shot, brain refers to the rate at which the CPU, for the opponent and your team members currently not controlled by you, makes decisions. Since this game is fast, to help you to adjust, you can select from different speed levels in all modes. The game is keyboard only. In "quick" mode setup screen adjust brain and speed levels with left/right arrow keys. There are 8 moving directions. You move in the diagonals by pressing two keys: left/right and up/down. There is only X for shooting. You also do the passing with it. Simple but you can do a lot with it. The game was developed as native C++ Linux application, then transpiled to html5 utilizing the amazing emscripten. All music made with a Novation Circuit. Recently changed ingame music. You now find the original tune Revolution as third alternative. Reason is, I was overruled :-) I hold the view that an aggressive tune suits best but others were fond of Pig Race. Also added Eruptions which is kind of a compromise. You find the non-shortened tunes on the main page. 0.91 Added two further tunes, Eruptions and Pig Race. Made the latter the default. 0.92 Added tune Victory to be heard after match win.